THE 17-strong Trinidad All-Schools soccer team arrives in Jamaica at 5 o'clock tomorrow afternoon for a five-day tour, promoted by the Kingston College Old Boys' Association and sponsored by the Jamaica Mutual Life Assurance Society. Their first match is on Tuesday night at the National Stadium against schoolboy champions Kingston College. Kick-off time is 8 o'clock, and the Trinidad High Commissioner will kick off the match. The Trinidadians play the All-Jamaica Juvenile Under 19's on Thursday night for the Jamaica Mutual Challenge trophy. The visiting team includes two school boys who played for Trinidad against the Brazillan under-20 team in Trinidad last month. One of these, Everard Cummings, is the "young Pele" of Trinidad schoolboy soccer, and is thought to be the game's greatest young 'schemer'. The other was W. Archibald, another of Trinidad's young "star boys". During their visit the boys will be taken on tour of various educational institutions and other places of interest, and will call on the Governor General at 11:30 on Monday morning. They will be guests at an official welcome luncheon at the Myrtle Bank Hotel at 12:30 on the same day. 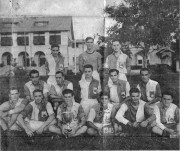 Members of the team are L. DeLeon, K. Josephs, W. Archibald, B. Waells, P. Bernard, A. Cupid, D. Furlonge, J. Stedman, A. Brunner, I. Martin, E. Sadphal, G. Harris, W. Smart, E. Cummings, R. Duprey, W. Jackson, A. Attwell, E. Fough, and E. James. They will be accompanied by their coach D. Bair, D. Traboulay the personnel officer, Father Farfan, secretary of the team, and Dom Basil Matthews, President of the Trinidad Football Federation. Store and Pancho's Sports and Games.